One of the great things about having a blog is that you get to celebrate all things cool. Books, movies, comics, games… if it keeps you up late at night, after your spouse has gone to bed wearing lingerie and a disappointed look, it’s usually worth at least a few paragraphs here. Of course you need to take things a little more seriously when talking about the real classics, the enduring masterpieces that define our very culture. And that goes double when we turn our attention to the supreme achievement of Western Civilization, the pinnacle of some three billions years of planetary evolution, Arnold Hendrick’s Barbarian Prince. Howard Andrew Jones did just that in his splendid post Return of the Barbarian Prince this week. It’s a terrific article and interview, capturing much of the fun of this sublime solo mini-game, except for his obvious lies about being able to win. You can’t win at Barbarian Prince. The game is an existential commentary on the nihilistic underpinings of modern evolutionary thought. I thought that was obvious. All games end in ignoble death, usually in the form of a starving goblin tribe that beats you to a pulp and steals your fur-lined booties. Listen, I’ve owned the game for nearly 30 years. Spent many evenings rolling dice and moving my lead miniature around the little map, befriending elves and exploring ancient crypts, and I have never won. Barbarian Prince is the beautiful girl I lusted after in high school. She hangs out and flirts like a Vegas show girl, but there’s no way she’s going out with me. At least I’m in good company. The distinguished John C. Hocking has never won the game. None of my friends have ever won. Only my false friends like Howard, who called last week to tell me he won a game on the first turn. Dude, if you’re going to fib, at least make it believable. Well, the good news is that now you can experience the timeless agony of Barbarian Prince for yourself. Now you too can spend your evenings cursing up a blue streak and throwing the map across the room. The original Dwarfstar boxed edition is unspeakably rare (most copies were destroyed in a blind rage, presumably), but you can download the complete game here, and Todd Sanders’ new revised version is available here. Howard tells me he’s mailing me a deluxe copy of the revised Sanders version, hand-made with carefully crafted components, which I anxiously await. Maybe a little of his luck will rub off on me. Maybe I’ll discover he’s adjusted the rules to make the game winnable. Maybe Todd’s revisions will clarify things just enough to lead me to victory. Or maybe there’s another tribe of starving goblins in my future, waiting to take my last copper piece and turn my skull into a drinking cup. False friends? So when you invited me to your home, that was manipulative calculation based on the slim probability of me ever being in the Chicago area again? And now you send me to BGG when it’s down for maintenance. I’m sensing a trend toward villainy here. Now I’m thinking the legendary Room of Wonder might not exist. Or it does, but it’s guarded by the undead bones of those who have fallen to your deceit. Which brings me back to that invitation! 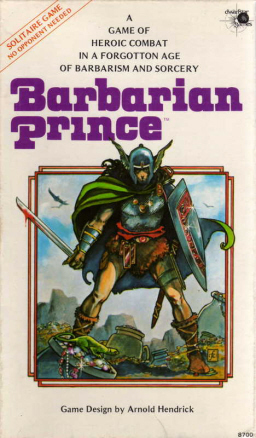 I suspect the Board Game Geek site is down due to overwhelming demand for Barbarian Prince. Barbarians at the Gates, in a manner of speaking. And the invitation to the Cave of Wonders is certainly still open. There’s even a cask of Amontillado here with your name on it. Bring a trowel though, I seem to have misplaced mine…. Ooh, I love sherry! And I do have a trowel I could bring. I apologize for that outburst earlier. Thanks for weathering it and renewing the invitation. You’re the best! My pleasure Fortunato… uh, Jeff.